According to the 2018 Pulse of HR survey, 69% of HR leaders in SMB’s are satisfied with their HR tech solution. But how happy are their employees? 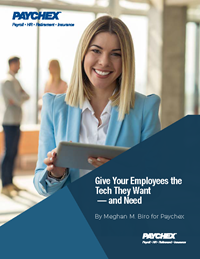 Even if leaders are thrilled with their HR tech solution — and that’s a very good thing — it’s not a win if employees feel like it falls short of giving them much-needed features, such as self-service interfaces they can get comfortable with, and a range of other options. How to close the "happiness gap"